Tom graduated from Westfield High School and then attended the Williston Northampton School in Easthampton, MA as a post-graduate. Tom continued on to Trinity College in Hartford, CT where he received a bachelor’s degree in Political Science. Following in the footsteps of two of his older brothers, Tom attended the Western New England University School of Law in Springfield, MA. He graduated from law school in 1993. During his last year of law school Tom was asked by the Hampden County District Attorney to become a “3:03” prosecutor, which allowed him to actually prosecute criminal trials even before graduating from law school. He conducted approximately 30 criminal trials before graduating from law school. After graduating and passing the bar exam (yes, he passed it on the first attempt), Tom became a full-time prosecutor in the Hampden County District Attorney’s office, in order to get as much trial experience and inside information as he could before going into private criminal defense practice. Tom engaged in approximately 100 trials and other criminal litigation hearings as a prosecutor before going into private criminal defense practice. In 1994, Tom started his private practice with a small firm in Springfield, MA. 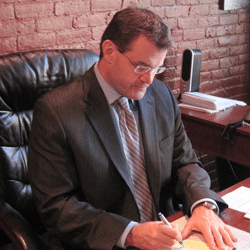 Along with a large criminal defense practice, Tom began his civil litigation career, handling everything from car accident personal injury cases to contract disputes and municipal cases. Tom practices in both state and federal courts across the Commonwealth. “I worked in the trial court for thirty nine years. Tom is one of the most qualified and competent Lawyers I have seen. I have a long relationship with Tom and I would be the first to call him for myself or any family member. Tom is very diligent. If you need a great Lawyer, talk to Tom.” W. L.